The Hawaiian Serenaders presented Story of the Ukulele and Concert on July 14 at Makawao Library in upcountry Maui. 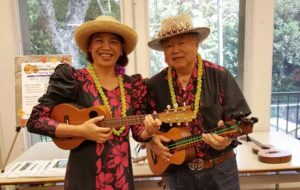 THE HAWAIIAN SERENADERS presented “Story of the ‘Ukulele and Concert at 10 a.m. on Saturday, July 14 at Makawao Library in upcountry Maui. This was our first performance at the Makawao Library and the second library show for the year as sponsored by the University of Hawai’i Statewide Cultural Extension Program. There were forty people including families with young children up to senior adults who attended. “You made my day – you’re an ukulele ambassador,” commented Jane Bush, an attendee who took photos and videos. The librarian was very happy and passed on comments by library patrons who wanted to know if there could be music every Saturday. The Hawaiian Serenaders is the stage name for our husband-wife duo as we entertain on ukulele, ukulele-bass, and vocals. We customized our concert to meet the educational requirement of our sponsor by talking about the ukulele and playing different musical genres. We gave the history of the ukulele, displayed our collection of soprano, concert, and tenor instruments with 4, 6, and 8 strings, and demonstrated the different sounds while strumming a “C” chord on a high “G” versus low “G” string tuned instrument. My husband gave a special demo on his ukulele-bass and played instrumental solos on it. We also played a few songs on my dad’s banjo-uke, a hybrid of the ukulele and banjo that first became popular in the 1920s. Koni Au I Ka Wai – Hum Ding-Ah Strum (history of the uke; King Kalākaua patronage). Sea Breeze/Puamana – I Wanna Rest Strum (uke began as rhythm accompaniment to singers and hula dancers – Aloha ‘Oe and On The Beach at Waikiki first songs that audiences heard outside Hawaii at Pan-Pacific International Exposition in 1915). Bill Bailey – Hum Ding-Ah Strum (1st of 2 banjo uke examples). Lahaina – Latin Strum (pop example with audience sing-along on chorus). Uwehi Ami and Slide – I Wanna Rest Strum (merging instrumental picking into local song). Medley: Yes Sir/Five Foot Two/Baby Face – Hum Ding-Ah Strum (1920’s sing-along). Ulupalakua – ‘Ōlapa Strum (Hawaiian place name song with English translation spoken). Could I Have This Dance – 2 Waltz Strums: Thumb Strum Up/Chicken Pluck (3/4 time and country music example). When You’re Smiling – Hum Ding-Ah Strum (2nd of 2 banjo uke examples). Blues in the Night – 4And Strum (change to blues genre and change to uke with high A for picking riff). Girl From Ipanema – Bossa Nova Strum (features u-bass solo and change to jazz genre). Visit our Hawaiian Serenaders webpage or visit our free online Fan Club to listen to over 100 songs you can learn to play the Ukulele Mele Way from wherever you live.